Former Maricopa County Sheriff Joe Arpaio has come up with a way to permit his thousands of supporters across the nation to fund his legal defense with tax deductible money. His non-exempt Legal Defense Fund has now received $250,000 from the new tax EXEMPT organization the National Center for Police Defense. Arizona's Politics has been reporting on the ongoing efforts by Arpaio - who is now facing a criminal contempt trial in June for admitted violations of federal court orders in the long-running Melendres v. Arpaio civil rights case. Impassioned solicitations for the Sheriff Joe Arpaio Legal Defense Fund (from Arpaio) have mistakenly informed his supporters that the contributions to keep him out of jail would be tax deductible. Ironically on Tax Day, this plea for money hit Arpaio's supporters' email inboxes today. It comes from the new NCPL, and includes one of the Sheriff's *personal* emails. (The entire email is republished below the jump in this article.) It emphasizes the unlimited, tax deductible nature of gifts. Arpaio's Legal Defense Fund is an opaque entity operated by Summit Group Consulting, the same consulting firm that has run Arpaio's campaigns and made him into an unparalleled fundraising machine. There is no evidence that the fund is incorporated in Arizona (or, elsewhere). No public disclosure of the funds received or expended is required under law. It is very likely that any monies raised by the fund and disbursed to attorneys on Arpaio's behalf are taxable income for the Sheriff. On his personal financial disclosure statement (filed while he was in office), Arpaio did not divulge receiving any income from this fund, nor did he list any gifts, reportable interests, or personal debts. Arpaio also maintains control of his campaign committee, which had more than $460,000 on March 31, 2017. His report filed last week does not show that any transfers were made to the NCPD during March, although that would appear to be one possible way for Arpaio to dispose of the campaign monies. Arizona's Politics has asked for responses and explanations from both Jim Fotis of the NCPD and Arpaio's longtime campaign guru Chad Willems. This article will be supplemented as needed. I wanted to make sure you saw this note below from my friend, Sheriff Joe Arpaio. We just received word that his trial will be pushed back... which means that he will have to pay EVEN MORE in expensive attorney fees. So, I'm asking if you can send your much-needed support with a one-time "extension" gift of $25, $50, $100 or even more to the National Center for Police Defense so we can help Sheriff Joe bridge the gap. Thank you so much for your continued support for Sheriff Joe and all our law enforcement officers! I don't have much time, so I'll keep this brief. You see, with less than two months until I stand trial, I'm determined to spend every second I can preparing for my legal defense and getting my affairs in order in the event the case against met for criminal contempt of court does not go my way. As you know, I'm in this situation because I took seriously my oath of office as Maricopa County Sheriff. And because I was so outspoken on the issue of illegal immigration, I find myself in a heated court battle. The Justice Department hold-overs from the Obama administration and their allies in the left-wing ACLU won't rest until they see me wearing prison orange. That's why I thank God everyday for National Center for Police Defense and folks like you who make its mission possible. 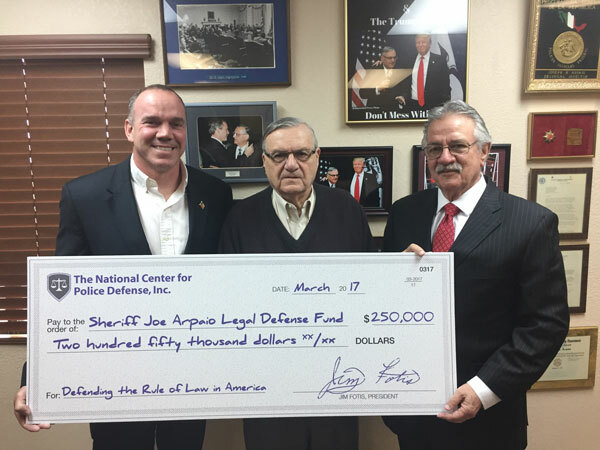 Under President Jim Fotis' leadership and your generosity, to date NCPD has already contributed a large sum of money to the Sheriff Joe Arpaio Legal Defense Fund. But with my trial date now just weeks away, the cold hard truth is this -- I'm preparing for a lengthy legal battle and fighting in court is expensive. So, I'm asking for your support because I need to fully pay for my defense. Today, Jim has asked me to reach out to a select group of NCPD donors to urge you to go above and beyond any amount you've ever sent before. I'm counting on you to click here and make a special gift of $25, $50, $100, or even $500 right away. As a retired public servant, I know this is asking a lot. I've spent my entire life in public service. After serving in the US Army during the Korean War, I then spent 55 years in law enforcement as a police officer, a top director of the US Drug Enforcement Administration and finally as Maricopa County Sheriff. So now, with my very freedom as a law-abiding, patriotic American at stake, Jim and I didn't see any other way to reach the amount we need in time. You see, my case isn't the only one on NCPD's docket. Just a month after my trial begins, another decorated officer, Betty Shelby, from Tulsa, Oklahoma is slated to face criminal charges for making the hard choice to defend herself in the line of duty. This is just another example of the fallout of the Obama Administration's War on Cops! Like me, Officer Shelby simply doesn't have the money she needs to survive on a cop's salary. That's why NCPD has set a goal of raising another $125,000 for her defense on top of the $20,000 they just sent her. Please click here to donate BEFORE time runs out for NCPD to help Officer Shelby and me! When you take into account the $125,000 Officer Shelby needs and what I'm short on my defense, the bottom line is NCPD must raise several hundreds of thousands of dollars, and frankly, they don't have much time to do it! MItch, they can't meet this goal without your support. That's why your gift of $25, $50, $100, or even $500 is so critical. The law-abiding citizens of this great country could always count on me to enforce the law do what's right. Now I'm counting on you. Please, do not delay. P.S. MItch, as a generous friend of NCPD, I know you already understand the high stakes in my pending trial. Your gift of $25, $50, $100, or even $500 is so important -- not just for me, but Officer Betty Shelby as well -- please send help ASAP. I thank you. The National Center for Police Defense, Inc. (NCPD) is a 501c3 non-profit organization. All contributions are tax-deductible as allowed by law, and are made with the understanding that NCPD has complete discretion and control over the use of all donated funds. If we receive more than we need for any one law enforcement officer's case, the remaining funds will be used to assist other officers and/or to help further other programs. Upon your written request to our national office (NCPD, c/o Day Johns, 10560 Main Street, Ste 218 Fairfax VA 22030), we will be pleased to send you a copy of our most recent audited financial statement. "As a retired public servant...."??? Truth be known, Arpaio is an ex-sheriff who was defeated at the polls by 13% of the vote in the last election. Thanks, Anon! In fairness, he did retire as a DEA agent, and he (was) retired as Sheriff after many successful elections. Did anyone think to check for transfers from NCPD to accounts controlled by Summit Consulting or other accounts in Arizona? Thanks, Anon, I like the way you think! NCPD has confirmed to Arizona's Politics that the $250,000 fake check was accompanied by a real $250k to the legal defense fund. We assume that fund is operated by Summit (see our previous articles). NCPD is a public charity, they are required to make their Form 990s available for public review. Based upon their previous filings they are rather small and finding these relatively large distributions should be easy. Now if they are paying money directly out to a law firm that would be legal, but not particularly prudent, but if you can show that the money goes into a "legal defense fund" for which people are being paid fees whom the charity could not directly pay well, then you could get a reward in theory from the IRS. We're barking up same tree. We've obtained their 2016 990 (not yet available on the charity websites), but their 2017 won't be due or available for a loooonnnnggggg time. Keeping in mind that their eventual 990 will never show whether Summit takes a fundraising cut out of the $250k, and that the legal defense fund is legally opaque, we're - as you allude to - working on theoreticals.